Indications: For the temporary relief of skin burns and pain from contact with hot surfaces, from scalding, and from the sun. For the temporary relief of vesicular eruptions like blisters, and inflammation after a burn. Natural burn medicine: Bye Bye Burns homeopathic medicine promotes a natural approach to medicine that works without chemicals, contraindications (interference with other medications you may be taking) or side effects to stimulate the body's curative responses to quickly repair and heal itself. This product is chemical-free, and is formulated and manufactured in accordance with strict FDA pharmaceutical standards. Conventional burn treatments are usually topical analgesics for the relief of pain, or antiseptics for inhibiting the growth of microorganisms. Typically these products use an assortment of chemicals which absorb into your skin and circulate throughout your body. BYE BYE Burns: Natural homeopathic ingredients, (Belladonna, Cantharis, Ranunculus bulb and Urtica dioica) are combined within a natural oil base of omega-3 fish liver oil, coconut oil, olive oil, and vitamin E, rich in antioxidants and antimicrobials. BYE BYE BURNS will nourish, protect and promote the rapid healing of the damaged areas of the skin. Depending upon the severity, you may notice that some burns that previously caused blistering and peeling to immediately occur, may not blister following the application of this product. Allowing the skin to remain intact over the area of the burn for a longer period of time, gives natural protection from germs, while providing more time for the skin layers below the surface to grow and replace the damaged areas. 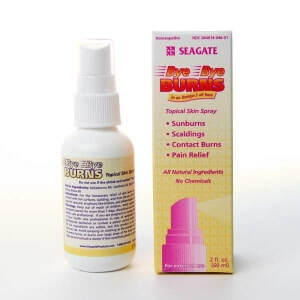 Topical Use: Bye Bye Burns comes with a convenient pump spray cap that will partially atomize these oils to allow the application of this product without the need to touch the burned areas of skin. If possible, carefully wash the affected areas to remove dirt and any other contaminants. For adults and children over 2 years of age, apply this product up to 4 times daily, if needed, or as directed by your health care professional. Most of the oil will absorb into the skin within15 minutes. Avoid contact with eyes. Avoid spraying clothing as this product will stain. Oil to Solid: Natural coconut oil is one of the main ingredients in Bye Bye Burns. This product can solidify if the temperature drops below 75 F during cold weather. Should this occur, simply warm the bottle for a few minutes in warm water or in your pocket. Warning: In the case of severe burns, burns over large areas of the body, or if the conditions persist after 7 days, or get worse, discontinue use and consult a health care professional.